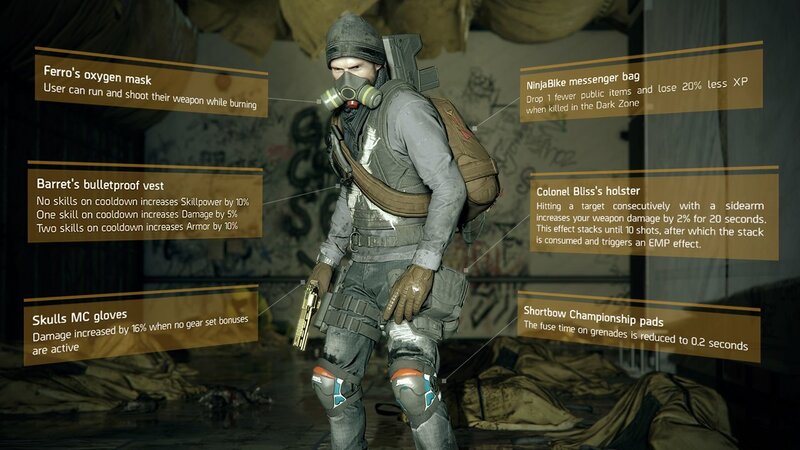 Exotic Items (previously known as Named Gear Items) are very rare items in The Division and named after special characters like Named Bosses. They have been introduced with Update 1.5, 6 in total – respectively one for each gear slot – and have, similar to High Ends, a unique Talent assigned. There are also a couple of Exotic Weapons available in the game. Not only are they improving build diversity, but also make them really valuable and interesting besides Gear Sets. as well as from Named Enemies (e.g. Ferro’s oxygen mask: Head of the Cleaners at Napalm Production Site, or Colonel Bliss’ holster: Commander of the LMB at General Assembly). The following table lists all Exotic Gear Items and the details reveal their approximate farming locations as well as item bonuses. Barrett’s bulletproof vest Chestpiece Powerful bonuses when skills are on cooldown. Ferro’s oxygen mask Mask Players can move and shoot while under burn status effect. Shortbow Championship pads Knee Pads Grenades have shortened fuse timer. NinjaBike messenger bag Backpack Less DZ loot and DZ XP lost when dying in the Dark Zone. Skulls MC gloves Gloves Increased damage when no gear set bonuses are active. Colonel Bliss’ holster Holster Powerful improvements for sidearms.